Bringing Internet Citizens - our program to support a better, more positive web - to 20,000 more of you in the UK. Internet Citizens, a Creators for Change program designed to help young people get the most out of YouTube and the wider web, and enable positive experiences online. Yvette Cooper MP, Chair of the Home Affairs Select Committee, joins YouTube CEO. 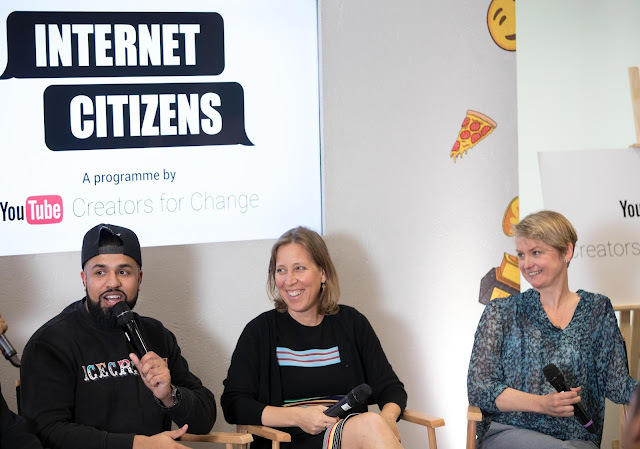 Susan Wojcicki and Creator for Change, Humza Arshad at London’s Internet Citizens Workshop. Every day we see your creativity shine on YouTube and frankly, we marvel at your panache in tackling all manner of subjects, some pretty tough. You take on stereotypes with style, like Dina Tokio and counter negativity with comedy, like Humza Arshad. But we also know it’s not always easy and that you can face challenges online. We’ve all come across comments or content online that’s shocked or even offended us, sometimes leaving us feeling isolated or powerless to change the conversation. From how to deal with offensive speech, to learning how to think critically about what you see online, and using tools like flagging and comment moderation, we’ve covered a lot of ground with the 500 young people we’ve met so far and sparked a lot of creativity on the way. Thanks to great feedback (and high demand! ), today we’re pleased to announce we’re bringing the Internet Citizens programme to 20,000 more of you in the UK, through workshops, youth workers and schools. We’re also going to make our curriculum, developed with many fantastic partners including ISD (Institute for Strategic Dialogue), UK Youth and Livity, available to everyone through our Internet Citizens site in August. We set out with the goal of inspiring you but as ever, you’ve inspired us. We’re looking forward to meeting more of you over the next months and continuing the work of Internet Citizens - to make a better, more positive web, for everyone. Back in April, we told you about Internet Citizens, a Creators for Change program designed to help young people get the most out of YouTube and the wider web, and enable positive experiences online. campaigning about climate change, or supporting your favourite creator to raise money for a cause you care about, or just being downright funny, we’re never in doubt of your passion or power to make yourself heard. The General Election on the 8th of June is an opportunity for people to have their voices heard -- by walking into poll booths and casting their votes. Tons of you are watching the election debates, chewing over the issues and thinking about who to vote for. And we encourage people - especially young people - to use their #PowerToDecide and make themselves heard in Westminster next week. From Humza Arshad to Suli Breaks to FunForLouis, creators from across YouTube are lending support to the #PowerToDecide campaign and uploading their own videos, like the Mandeville Sisters to rally their fans to vote in the run up to polling day. Use your #PowerToDecide. Vote on 8th June. Every day you show us how strong your voice is. Whether you’re campaigning about climate change, or supporting your favourite creator to raise money for a cause you care about, or just being downright funny, we’re never in doubt of your passion or power to make yourself heard. On May 22nd, these creators will join us for week-long creator camp at the YouTube Space London. On top of video production workshops and coaching from the YouTube Partnerships team on how to grow their audience like a pro, creators will also meet a range of folks within YouTube to gain insights on the platform and on the industry. Winners will also receive a voucher for production equipment. If you’re in France, India or Japan and would like to join us over at an upcoming NextUp, we’re currently accepting entries through Wednesday, May 17th. For more information, visit youtube.com/nextup and follow the action on Twitter with #YTNextUp. Nearly all of us will have come across comments or content online that shocked or even offended us, sometimes leaving us feeling isolated or powerless to change the conversation. For young people in particular, this sense of vulnerability can be heightened especially when something is shared on social media by a trusted friend. That’s why we’re launching Internet Citizens, a series of day-long workshops for 13-18 year olds in cities across the U.K., as part of our global YouTube Creators for Change program, which supports creators who are tackling social issues and promoting awareness, tolerance and empathy on their YouTube channels. The workshops will help young people find a positive sense of belonging online and teach skills on how to participate safely and responsibly, and use tools such as flagging and comment moderation to make the web better for all. Some of the specific topics include what could be done in response to offensive speech, fake news, echo chambers and how they could use video to bring diverse groups together. Our curriculum was designed by experts from the Institute for Strategic Dialogue, in partnership with UK Youth and Livity, and was also informed by our work with an advisory council including Faith Associates, Active Change Foundation, the MET Police, Demos and the Diana Award. Hosting these workshops are Alain “Fusion” Clapham and Efe Ezekiel, along with YouTube creator Nadir Nahdi, Founder of BENI, all of whom have mastered the art of using their voice and creativity to drive social change. We’ve spent the last few weeks testing the workshop before our launch today in Liverpool, and have seen some promising results. 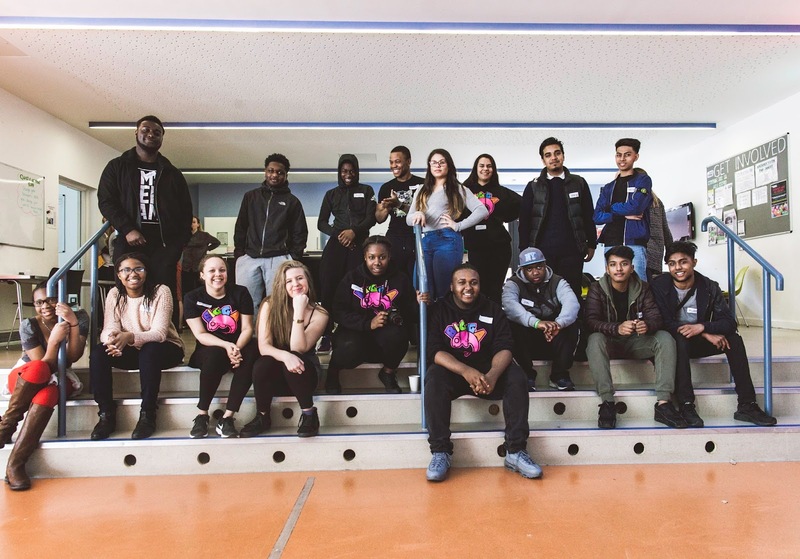 With the help of UK Youth, we’ll visit youth clubs across the country over the coming months, and we’ll also explore ways to work further with youth workers and other partners to scale the program. This is just one part of our commitment to a better web. Alongside this, we’re exploring more innovative ways to use technology and to partner with experts to help us tackle hate speech online. We’ll share more updates on these areas in the coming weeks. And Fusion said it best: The internet is what we want it to be. It can be an unpleasant place where people misunderstand and deliberately deceive each other. Or it can be this amazing place where we can share, collaborate, understand and help each other. We all have a part to play in making it that positive, healthy place. It sounds big, but actually it’s easy and you know what to do. Stand up for the web you want. To find out more about Internet Citizens, please visit our website. The internet is a place where anyone can have a voice, be part of a community and generate positive social change. But the internet isn’t always positive or welcoming for everyone. Each year in the UK, we work with a handful of YouTube creators and celebrate the fact they took to YouTube to tell their stories. In the past, we’ve used these campaigns to call out the uniqueness of a creator’s voice, like VICE, or the ingenuity of their storytelling, like Copa90, or the breathtaking breadth of their appeal, like Zoella. Mostly, we’ve used this moment to celebrate the talent and tenacity of the people and channels who’ve done it entirely on their own, and resolutely, in their own way. This year, when we thought about who to spotlight, we tied ourselves in knots. Which creator? Which channel? Who’s emblematic of the platform? Who’s super fly? Who’s funky fresh!? And every time we got close to making a decision, we felt like we were missing something really important. The fact being: a focus on one or two creators is the tip of a creative iceberg; the tip of a universe of popular culture that’s driven by you, users and creators. There are close to 200 UK-based channels that have over a million subscribers each. Each! Great Britain’s YouTube stars rank on influence lists that feature Presidents, Olympians and Hollywood royalty. And the content created on YouTube is at the cutting-edge of pop culture, exposing us to new passions, new trends and new faces, daily. Should we spotlight Joe Sugg, whose Whisper Challenge is now a global phenomenon picked up as a regular bit by Jimmy Fallon’s Tonight Show? Do we call out Humza Arshad who, aside from being plain funny, is using his mega-popularity to spread a message of positivity and peace. Or do we go big on Dina Tokio, who’s taking a totally new type of content - modest fashion - to the masses? We hair pulled. We beard stroked. And finally, we had a brainwave. There’s no one story that can sum up YouTube - we’re what users and creators make us. You decide what is important. You set the agenda. We are #madeforyou. Which incidentally, is this campaign’s name and we’ve built it around as many creators as we can decently fit into one spot. Eighteen to be precise: Colin, Dina, Humza, Suli, Caspar, Scola, Oli, Kaushal, TomSka, Jemma, Vikkstar, Joe, Patricia, Emma, Lindy, Louise, Marcus and Tanya. Some you’ll already know and love; some you might not yet. But between them, they’ve racked up over 48 million subscribers to their channels - and they couldn’t be more different. From mad scientists to spoken word poets, they reflect the vitality of the UK’s creative spirit and the diversity of our tastes. Which feels like a lot to celebrate. So forgive us for breaking with our own tradition on this one. And for going a little overboard. But it felt like a fittingly YouTube thing to do. Rich Waterworth, Director of YouTube Marketing in EMEA recently watched Caspar Lee’s Singing Lessons w/Justin Timberlake & Anna Kendrick. An engine for your creativity and a home for your culture. badly behaved cape. Sam Smith silencing a whole arena with his incredible voice. The BRIT Awards with MasterCard has given us some of the most memorable moments in music history. For the third year, you can watch this must-view music moment streamed live on the BRITs channel if you’re based outside of Great Britain. Just tune in at youtube.com/Brits on whatever screen you find yourself closest to: mobile, tablet or TV. Some of your favorite YouTube stars will be there live to bring you yet more action. YouTube stars Dan & Phil will present the official BRITs YouTube live stream featuring backstage action and more fun and games. Kingsley will be on the red carpet, rubbing shoulders with the biggest stars as they arrive to create more content for the BRITs YouTube channel. And what stars! This year, international artists like Rihanna will join breakthrough British artists like James Bay for an unforgettable night of live performances. Not one, but TWO holders of YouTube’s prestigious “billion views” club will also perform: Adele and Justin Bieber. That’s alongside live performances from Coldplay, Jess Glynne, Little Mix and The Weeknd. After the live broadcast, individual artists will upload their performances to their own YouTube channels for you to relive again and again, plus there will be catch-up content on the BRITs channel itself. So, tune in on February 24 at 3 p.m. ET to the official BRITs channel, kick back and as they say in good ol’ Great Britain, prepare yourselves for a right royal knees-up. Christophe Muller, Head of International Music Partnerships at YouTube and Google Play Music, just watched “Dan and Phil’s Wheel of Wonder With Jack Garrett | BRIT Awards 2016. Jarvis Cocker crashing Michael Jackson’s performance. Madonna’s badly behaved cape. Sam Smith silencing a whole arena with his incredible voice. The BRIT Awards with MasterCard has given us some of the most memorable moments in music history. For the third year, you can watch this must-view music moment streamed live on the BRITs channel if you’re based outside of Great Britain. Just tune in at youtube.com/Brits on whatever screen you find yourself closest to: mobile, tablet or TV. In 2015, you introduced the world to the latest dance crazes, opened up discussions about diversity and inclusion, and lip-synced in cars and onstage in front of millions. The trends you participated in and the creativity you shared defined the year on YouTube in a bigger way than ever before. Rewind is our way to help you celebrate some of your favourite moments on YouTube through our official top trending videos of 2015, based on the amount of time people spent watching, sharing, commenting, liking, and more. Topped by one of the year's biggest dance trends, these videos were watched for over 25 million hours and were created by powerhouse channels with over 40 million subscribers between them. For the first time, not just one, but four television moments made the top Trending Videos list. Three are late night TV videos of widely popular YouTube trends: the lip sync battle, the in-car singalongs, and the reading of mean tweets. You all love late night TV on YouTube—the time people spent catching up on late-night clips like Corden, Fallon and Kimmel nearly doubled in the last year alone! When it comes to music, 2015 saw some of our fastest-rising videos of all time. Wiz Khalifa's "See You Again" reached over 1 billion views in just 6 months and Adele reached the year's top 10 in just a few weeks. The top 10 music videos collectively have more than 66 million subscribers, and people spent over 37,000 years playing them in 2015. ...and check out even more top music videos. In the UK, we also went mad for lip syncs, in-car singalongs and poignant play-days, while we topped and tailed our lists with breathtaking moments from Britain’s Got Talent. Our obsession with Frozen’s “Let it Go” continued for (yet) another year through a brilliant real-life tribute, while FIFA’s “Play Beautiful” commercial and The Force Awakens trailer had us glued to our screens and excited as hell. And of course if wouldn’t be YouTube without some full-on fun courtesy of a marvellous PIXAR-inspired makeup transformation and two mad UK scientists and a giant water balloon.... hit click and enjoy! And if you love staying on top of the most-anticipated new trailers, hottest music videos, and viral clips from YouTube creators, today we unveil the new YouTube Trending tab. This new tab in your YouTube app delivers the top trending videos directly to your Android, iOS, and desktop device. It's the best way to catch the videos, creators, and trends that people watch, share, and talk about each and every day. See 'em as they take off and before they appear in YouTube Rewind 2016. aAnd for more Rewind fun, check out the YouTube Rewind channel!